The big clubs have an interesting run of fixtures coming up. 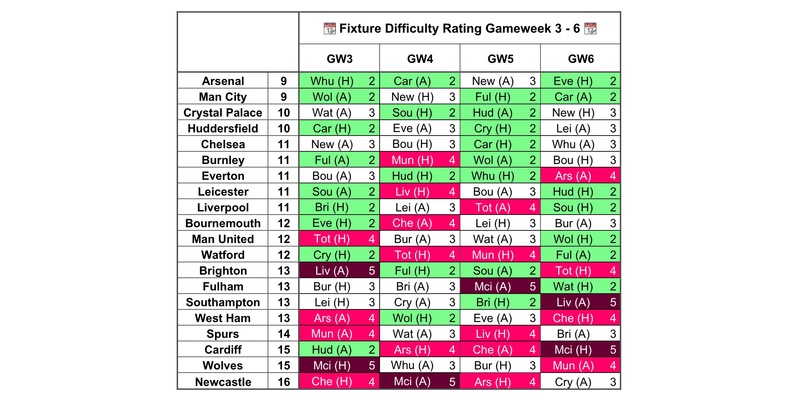 We look ahead to the Gameweek 3 fixture charts and beyond. Arsenal, Manchester City, Crystal Palace, Huddersfield and Chelsea face none of last seasons top six in their next four games. The Arsenal defence looks inconsistent, but Mkhitaryan and Aubameyang should provide points in attack. Manchester City are difficult to predict, with plenty of rotation. Ederson and Mendy are the safe routes into the defence, with a littering of attacking returns and bonus points too. Aguero is the in-form attacker. Crystal Palace have proven to be tough defensively, look at Tomkins or Hennessey for a cheap route into their back line. A disappointing start for Huddersfield makes it difficult to invest in them. Chelsea have got off to a great start under Sarri, with Alonso the standout pick in their defence. The attacking formation is still developing, but Pedro should provide returns for the next few weeks. Burnley, Everton, Leicester, Liverpool, Bournemouth, Manchester United and Southampton have just one tough game in this period. While investment should be prioritised for the “Ones to Watch”, consider the form players here. Liverpool players are very popular right now, with back to back clean sheets and plenty of goals. If you don’t own already, it’s not too late to jump on board Robertson, Salah and Mane. Richarlison has seen plenty of transfers this week, while Periera is an interesting out of position prospect for Leicester. With controversy at Manchester United, plus Spurs up next, I wouldn’t be too bullish on their assets. Southampton haven’t created much as yet, but Ings is a tempting budget option up top. Cardiff, Wolves and Newcastle should be avoided, with a challenging spell of games. Lascelles has significant ownership, but clean sheets look unlikely over the next three games. Neves is a very popular option in the Wolves midfield, after a promising Gameweek 1. It may be tempting to move for a similarly priced Chelsea midfielder.